Effective January 1, 2019, the Essex-Windsor Solid Waste Authority will be restricting the use of Transfer Station #2 to small commercial, farm and residential vehicle and commercial packers. Due to operational constraints and safety concerns, we can no longer process tandem axle and tri-axle dump vehicles at our facility in a safe and efficient manner. Tandem axle and tri-axle dump vehicles hauling waste and demolition debris will be directed to use the Regional Landfill Site, located at 7700 County Road 18, in the Municipality of Essex. Any customer who would like more information or would like to express concerns, please call the Regional Landfill at 519-776-7941 ext. 1961 or 1962, or email tommarentette@ewswa.org or dvanhorn@ewswa.org. Transfer Station #2 operates six days a week as a staffed, self-serve, self-serve public facility where residents and businesses can drop-off large volumes of waste for recycling or disposal. Most of the Essex-Windsor municipalities provide regular garbage, yard waste and recycling pick up at curbside, however Transfer Station #2 exists for those items which are too large for, or are in quantities large enough, to render them unacceptable at curbside. 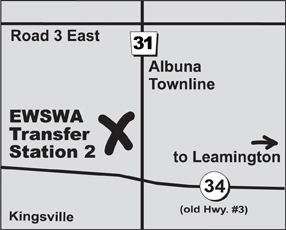 Transfer Station #2 is located at 2021 Albuna Townline (County Rd. 31) in the Town of Kingsville. Transfer Station #2 is open year round, six days a week. Monday to Friday 8:00 a.m. – 4:45 p.m.
Saturday 8:00 a.m. – 1:45 p.m.
Monday to Friday 8:30 a.m. – 4:15 p.m. Transfer Station #2 is closed on Sundays and major holidays. New Year’s Day (Jan. 1, 2019) – closed. Family Day (Feb. 18th) – closed. Good Friday (Apr. 19th) – closed. Easter Monday (Apr. 22nd) – OPEN. Victoria Day (May 20th) – closed. Canada Day (July 1st) – closed. Civic Holiday (Aug. 5th) – closed. Labour Day (Sept. 2nd) – closed. Thanksgiving Day (Oct. 14th) – closed. Remembrance Day (Nov. 11th) – OPEN. Christmas Day (Dec. 25th) – closed. Boxing Day (Dec. 26th) – closed. New Year’s Day (Jan. 1, 2020) – closed. Transfer Station #2 accepts many different types of materials including: electronic items, garbage, household chemical waste, recyclables, scrap metal, tires, white goods (appliances), and residentially delivered yard waste. Transfer Station #2 is open to both residents and businesses. Some items are assessed a tipping fee while others are not. Please refer to the current tipping fee schedule for materials and rates. Listed below are all the payments methods currently accepted at Transfer Station #2. Cheque – A $25 charge will be applied against NSF cheques. Drawdown (For Business Customers: Drawdown Account constitutes payment in advance. Payment is credited to your account and tipping fees are deducted after each use). Ontario Electronic Stewardship (OES) is a not-for-profit organization formed by leading retail, information technology and consumer electronic companies to implement the Waste Electrical and Electronic Equipment (WEEE) Program Plan under the Waste Diversion Act. The plan requires brand owners, first importers, franchisors, and assemblers to pay fees for electrical and electronic equipment (EEE) supplied to Ontario. Collected fees will be used by OES to operate the WEEE program. All garbage is assessed a tipping fee. Many everyday household chemical products are considered ‘toxic’ to our local environment. It is extremely important for all homeowners to remember that once they are finished with a household chemical product, the “leftover or unused portion” should NEVER be thrown in the garbage, poured down the kitchen sink or a neighbourhood storm drain. When toxic products are disposed of improperly (i.e. as litter or poured down storm drains or kitchen sinks), they have the potential to “leach” into the ground, become airborne, or contaminate our local watersheds. Residents can drop off the following products – free of charge. Please note, this list is not comprehensive – this is just a sample of the types of products accepted. For more information regarding household chemical waste please refer to the Municipal Hazardous or Special Waste (MHSW)section of the website. There are designated bins available at Transfer Station #2 for items that are considered recyclable. Residents and businesses can drop-off the following recyclable materials free of charge. Scrap metal items (i.e. swing sets, barbeques, etc.) can be dropped off free of charge. Tires with/or without rim are free to drop off, with a maximum of eight tires per year. Types of tires included: car tires, truck tires, off-road tires, tires of all sizes. Excluded are bicycle tire and airplane tires. After eight tires a tipping fee will be assessed. Residents can drop off old appliances (white goods) i.e. fridges, freezers, stoves, microwave ovens, etc. Drop off is free, however, items with a compressor will be assessed a charge for the removal of CFC’s as required by the Ministry of the Environment. EWSWA receives more than 20,000 tonnes of grass, leaves and other yard waste each year. These organic wastes are processed, shredded, screened and cured into nutrient-rich compost.